Aldo van Eyck, Herman Hertzberger, James S. Ackerman, Giancarlo De Carlo and others in the Preface to the Harvard Educational Review 1969 Special Issue, “Architecture and Education”. We are pleased to announce 3 linked seminars on the theme of Architecture and Education to be held at the Faculty of Education, University of Cambridge during 2018, funded by a University of Cambridge Arts and Humanities Research Award. Taking the ideas of the 1969 issue as a springboard, participants and invited keynote speakers will consider the role of the built environment in education and schools today – how it might “inform and shape and liberate the human spirit” but also consider critically whether it ever has (and if it has, how) so that we might learn from the past to inform our decisions in the present. 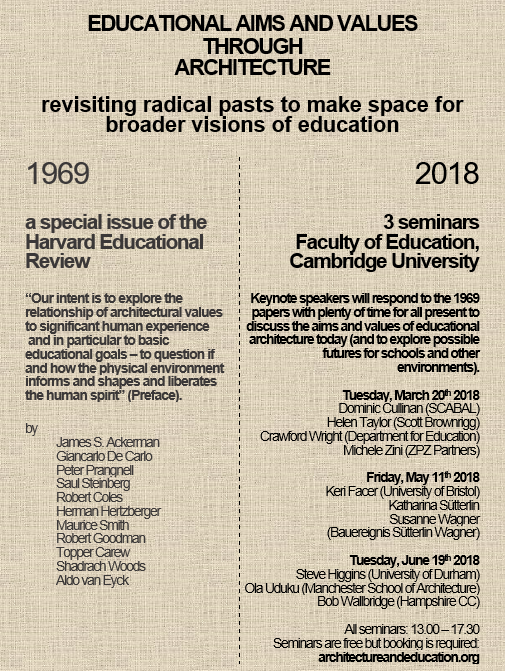 Each seminar will draw on a remarkable special issue of the Harvard Educational Review that, following the events of 1968, put forward bold and passionate proposals from some of the leading architects of the time as well as planners, community activists, artists and a child psychiatrist. Keynote speakers will help to frame the debate but the seminars will ensure plenty of time for discussion – we want to acknowledge challenges, exchange ideas and explore proposals that foreground architecture and design in creating a radical agenda for increasing the humanity of spaces supporting 21st century education, spaces that include but go beyond learning and attainment. Steve Higgins (Professor of Education, University of Durham): Steve’s broad educational research experience has seen him investigate the possibilities and limitations of educational research, students’ learning, the role and effectiveness of technology in the classrooms, educational spaces, and the work of John Dewey. Ola Uduku (Professor of Architecture, Manchester School of Architecture): Ola is an architect and researcher of architecture. She is particularly interested in the history of educational architecture in Africa and the human and social consequences of contemporary urban infrastructure. Her work draws important attention to the values that are expressed (as well as suppressed) in architectural design. Bob Wallbridge (Design and Implementation, Hampshire County Council): Since the 1980s, England has seen a dramatic reduction in the number of publicly employed architects – Hampshire County Council is remarkable by continuing to invest in architectural expertise, particularly when it comes to inspiring school designs and long-term visions of value. As Head of Design, Bob will provide an insight into public architecture for the public good. Organisers / Contact: Dr Catherine Burke and Dr Adam Wood via the form below. The Architecture and Education 1969 special issue of the HER was the written and artistic work of eleven European and U.S. contributors (seven Architects, one Child Psychiatrist, one Community Activist and Film-maker, one Artist and an Architectural Historian. Planning for it started in 1967 but the student revolutions in Europe and the USA in 1968 made the concerns of individual essays and the aim of the overall issue more urgent. At the same time the writers were keen to retain an open, dialogic stance: “While authors were invited to write on the reciprocal implications of architecture and educational concerns we do not see this issue as providing specific answers. Hopefully this will initiate a greater collaboration through which both architects and educators may find new insights” (Contributors, Preface, HER Vol 39, Issue 4). Individual papers and links are given below with brief descriptions. Sorry, the papers are available for free only via institutional logins (and even this is often difficult outside of the U.S. – please try emailing pinnaclesupport@allenpress.com if this is the case). Alternatively, they can be bought via the homepage for the special issue, here. Ackerman, James S. (1969) “Listening to architecture”. Harvard Educational Review. 39 (4), 4–10. Architectural Historian. Writing. How architecture communicates with the public and school buildings as expressions of power. The paper also includes quite an interesting “Sketch of a Job Description for the Client of an Educational Building” as an appendix. Carew, Topper. (1969) “Interview with Topper Carew”. Harvard Educational Review. 39 (4), 98–115. Architect, community activist and film-maker. Writing and photographs. How more culturally-specific architecture and planning with and for black communities might come about. School might be better taken to people than vice-versa. Coles, Robert. (1969) “Those places they call schools”. Harvard Educational Review. 39 (4), 46–57. Child Psychiatrist. Children’s writing (and drawings). School and school buildings as they are and as they might be. De Carlo, Giancarlo. (1969) “Why/How to Build School Buildings”. Harvard Educational Review. 39 (4), 12–35. Architect. Writing and photographs. The need to understand why we build schools before how to build them and so what purposes they serve, how those purposes might be achieved differently, and the tendency for educational institutions to solidify their own existence limiting their ability to serve the people they were designed for. van Eyck, Aldo. (1969) “The Enigma of Vast Multiplicity”. Harvard Educational Review. 39 (4), 126–143. Architect. Photographs and some fairly experimental writing arguing that in contrast to small communities, living at scale has so far created only “organized nowhere”. Goodman, Robert. (1969) “Liberated zone: An evolving learning space”. Harvard Educational Review. 39 (4), 86–97. Architect / Planner. Writing and photographs. The retelling of how a youth centre was built through participation and advocacy planning. Hertzberger, Herman. (1969) “Montessori Primary School in Delft, Holland”. Harvard Educational Review. 39 (4), 58–67. Architect. Writing, photographs and plans proposing the classroom and school as home and street. Prangnell, Peter. (1969) “The Friendly Object”. Harvard Educational Review. 39 (4), 36–41. Architect. Writing only. How design can inspire people to use buildings more creatively. Eveline Lowe Primary School, London is used illustratively. Smith, Maurice. (1969) “NOT-WRITING on BUILT-FORM”. Harvard Educational Review. 39 (4), 69–84. Architect. Experimental writing (and some sketches) questioning the role of architects and the purposes of schools and school buildings. Steinberg, Saul. (1969) “Drawings by Saul Steinberg”. Harvard Educational Review. 39 (4), 42–45. Artist / Cartoonist. Three satirical sketches attacking the negative and repressive effects of schooling. Woods, Shadrach. (1969) “The Education Bazaar”. Harvard Educational Review. 39 (4), 116–125. Architect. Writing and architectural sketches. Education should extend through the city: a “non-centric, educational web” that would replace the school and school building. Alternatively if you have a specific question, please use this form. Thank you.